As a member, you’ll receive exclusive benefits like invitations to special events during the year, access to webinars with TPWD experts, and other members-only perks. And, you’ll be supporting TPWF’s work to conserve our state’s wild things and wild places. 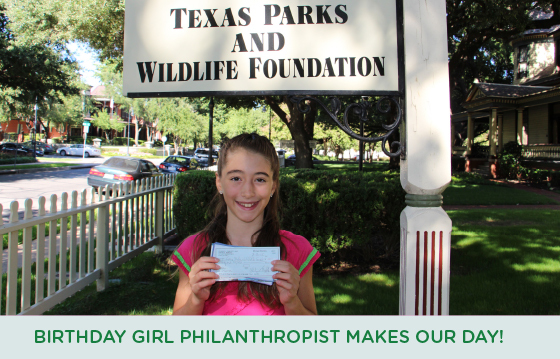 Help keep Texas wild for everyone - join TPWF today. *The price of membership pays for TPWF membership only and not for the chance to win the YETI cooler drawing. Members who join between October 16 and November 5 are automatically entered in the drawing. Earlier this year, there were 49 WMAs across Texas devoted to research, demonstration of proven wildlife management techniques, and conserving the natural habitat that the wild things of Texas need to survive. Now, thanks in part to private donations through Texas Parks and Wildlife Foundation, there are 50. This latest acquisition, the 5,458 acre XO Ranch in Palo Pinto County, is one of the best remaining examples of Cross Timbers habitat left in the state. In the future, wildlife research and habitat restoration will take place here that will help Texas Parks and Wildlife biologists better manage the land for the wild creatures we all treasure. This could lay the groundwork for further research to establish healthy populations of species like bobwhite quail and Texas horned lizards. Watch this video to learn more about a TPWD wildlife research project that is exploring ways to bring back the Texas horned lizard. Congratulations to Blanco State Park! Blanco received the most votes in the This Bud’s for Texas Parks favorite state park contest and will receive a generous $25,000 grant sponsored by our friends at Budweiser. "It's been wonderful to see the outpouring of support for state parks during this promotion," said Brent Leisure, Texas State Parks director. "This grant will go a long way in helping us to continue enhancing our parks. We appreciate Anheuser-Busch's support of Texas State Parks!" Still want to support your favorite state park? Make a donation now! TPWF staff in Dallas were thrilled to meet Sabrina Gordon on a recent Friday afternoon. The young Frisco resident celebrated her 10th birthday in August, and instead of having friends bring gifts, she asked party guests to help her raise money for a good cause. We invited Sabrina and her mom to our offices and learned first-hand of her passion for Texas wildlife. Choosing to donate to our species conservation fund was a perfect fit. Want to follow in Sabrina’s footsteps? Donate today.